Bike-sharing could come to Milwaukee next spring, At Wednesday’s meeting of the Public Works Committee, members voted unanimously in support of a resolution by Aldermen Bob Bauman, Nik Kovac, Michael Murphy, and Tony Zielinski directing city departments to pursue a bike-sharing program. The resolution directs them to identify funding, work with organizations to implement the system, and assist in efforts to establish and maintain bicycle facilities. Bike-sharing programs create a series of kiosks throughout a city which allow users to rent bicycles for short trips. The bikes are generally a sturdy, one-size-fits-all design that’s easily used by people of all skill levels. An analysis of Denver’s program, which boasts 50 stations and 500 bikes, showed that in 2010, 43 percent of all system trips replaced automobile trips. This saved 15,868 gallons of gas, prevented 312,121 lbs of carbon from entering the air, and saved users $311,126 in parking fees. The Milwaukee effort has been spearheaded by Bruce Keyes, Barry Mainwood and Jack Hirt, who make up Midwest Bikeshare, Inc., a non-profit which promotes such systems. Midwest Bikeshare seeks to fund the system through a variety of sponsorships, partnerships, ad placements on the system, memberships, and fees. The Milwaukee system would start with 25 stations focused on Downtown, and would operate from March until December each year. UWM, Marquette University, Schlitz Park, The Historic Third Ward Association, and the US Bank building have all expressed a desire to be partners in helping start the system. 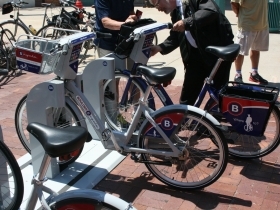 If the plans move ahead on schedule, bike-sharing could roll out in Milwaukee by March 2013. This weekend there is another opportunity to try out B-Cycle’s bike-sharing system. There will be four B-Cycle bikes available to try out at the Tour De Fat, starting at 10 a.m. this Saturday. I used Montreal’s bike sharing system while attending a week-long seminar in Montreal last summer. Particularly when combined with Montreal’s system of dedicated bike paths, it was very convenient. The only problem I ran into was imbalance. Some stations would be out of bikes while others would be completely full, so there was no place to deposit the bike. The challenge is that traffic often runs in one direction in the morning, from residences to work places or school, and in the reverse direction in the evening.